As expected, FCC’s Net Neutrality rules have been struck down by the court. The reason is FCC’s position is self-contradictory. 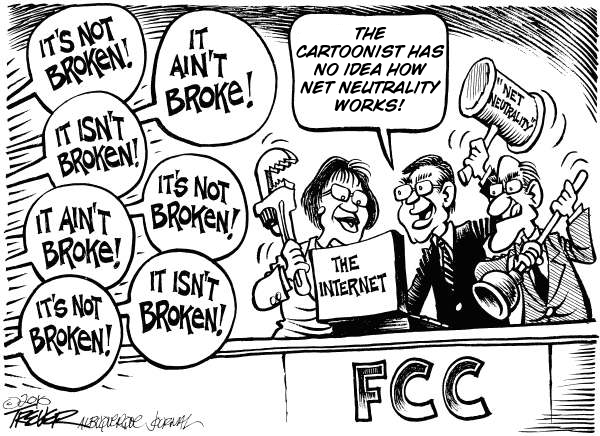 2002 FCC rule classified broadband/Internet as an information service, and outside the purview of FCC regulations. But 2010 FCC Net Neutrality ruling, placed conditions on the Internet service providers. Verizon’s challenge brought out this contradiction, and the court invalidated FCC’s 2010 Net Neutrality rules. What is the way forward? The solution is not restoring Net Neutrality, as some have suggested. Net Neutrality is a legal construct imposed on how networks are to be designed. Legal principles have no place in the design of networks, or for that matter, in the design of any technology products. But legal rules may be applied in the manner in which the technology systems are operated, or used. Designing network systems involve making tradeoffs for efficient resource allocation, functionality and preventing deadlocks. This inherently involves treating different sets of bits differently. Hence, prudent engineering practices cannot be reconciled with the legal principles embodied in the Net Neutrality. However, imposing telephone-centric common carrier regulations are also not appropriate for future networks, if it is to evolve to its full potential. The reason is that the phone-centric regulations were a compromise: In exchange for a government sanctioned monopoly [2, 3], AT&T agreed to be regulated as a utility. Network industry is no longer a monopoly, but has many entrenched competitors. And one of the critical issues is limiting market power abuses. One issue, probably the most important, absent from the extensive discussions is the technology constraints involved. One critical factor for the current impasse is the lingering aftereffect of the dot-com bubble. The dot-com bubble created and reinforced the idea that all future networks are to be IP (Internet Protocol) based – “All-IP.” However, there is no technology rationale for this conclusion. There are four primary data types: voice, data, video, and connected devices. Each has its own unique characteristics and requirements. Developments in digital technology enable transmission of all these data types over packets (internet.) That does not mean that the optimum network for these data needs is internet. The situation is similar to transportation. It is feasible to build flying cars that also operate in water. But nobody argues that flying cars should be the universal transportation solution. We have car, bus, train, boat, ship, plane, spacecraft, etc. Each of these are designed for different transportation needs and requirements. If we design networks in a similar manner — design different networks optimized for different services targeted for different data types — the issues related to the Net Neutrality will get simplified, allowing simpler resolution. However, such an approach will provide only limited, if any, opportunities for political drama. This entry was posted in Net neutrality and tagged FCC, Net neutrality, Telecom. Bookmark the permalink. George, you’re forgetting one crucial point; when a business such as Verizon or Time Warner cable provides multiple resources such as Internet Access AND Telephone service, they will naturally want to control which services a subscriber uses, and they will generally want you to use their expensive long distance telephone service over something like Skype or another low cost alternative. Net Neutrality supporters aren’t opposed to the competition aspect; they are opposed to a single powerful entity in an area forcing subscribers to use certain service over others by throttling bandwidth using packet inspection techniques and other methods. I suspect that many people that use Skype and other similar services do so because otherwise they would have NO contact with the people that they have been due to financial concerns.